Lunch in schools is often noisy or at least it can be at times. Not because anyone is out of control, per se, but often just because it’s a happy, less structured time of the school day when kids are socializing and enjoying each other’s company. When conversations take up entire tables and the table next to you is doing the same, the decibel level begins to rise and lunch is noisy. So, while some teachers are still scratching their heads over why kids can’t eat quietly with decorum like adults, I began questioning my students to start working on a solution. I found a couple articles and a study from 1999 about playing music during lunch periods and the benefits. The study actually measured the decibel levels of lunchtime noise and counted the number of lunch duty personnel who had to intervene in student behavior problems before and after the implementation of the background listening music. The results were not huge, but still, quite significant. The decrease in overall noise and behavior issues was notable. I began seriously not only contemplating asking our administration to look into this as a solution, but furthermore, I began formulating a Project Based Learning project from it. Not only are the teacher frustrated with the noise levels at lunchtime, but students are as well. Maybe we could create our own study on the effects of implementing music during the lunch period? As a member of an curriculum overhaul committee at another school (aptly names the “Arts Task Force”) part of our research was to study best practices from other schools that matched our educational philosophy and demographic and that we considered “peer schools” and had performing arts programs that were similar to what we aspired to create. After several schools had been identified, our committee took a trip to spend some time in each. This allowed us to not only see some “best practices” of successful arts programs in action, but also allowed us to see if these programs and schools were truly a good fit for a model of what were were hoping to achieve. One such school in Los Angeles impressed us with their facilities, teaching staff and programming. We spent two full days there, learning all we could, gathering materials about curriculum and sharing resources. One thing that stuck out to me, however, was that the arts permeated nearly every aspect of their school culture. They had not only empowered arts education in their classrooms, but outside of them as well. On their High School campus, they had a casual area for students to eat on the lawn or in chairs at tables scattered around in an open outdoor park type setting. At the center, was a place for student performances. It was explained to us that a sign-up format was run entirely by students and that student bands, vocalists of both a classical and pop nature, guitarists and even comedians had booked the space for lunch time performances for months out. A clear set of guidelines was established by a joint advisory groups of administrators, arts teachers and students. At their middle school site, students ate in a more traditional cafeteria setting, but as you walked into the cafeteria, you saw a large sign that stated “Today’s Music brought to you by Vivaldi.” Upon entering the cafeteria, you heard a great deal of conversation, albeit calm. Music played overhead and worked it’s way to the masses, calming them. It wasn’t music that kids would sing along to, but it was a gentle soundtrack that set a tone for how lunch should be; calm and reverent, but also inviting and interactive. Some schools that I have worked in and visited, require that students are not allowed to speak at all during lunch and have to eat in silence. 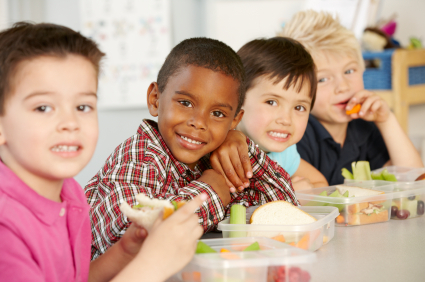 While I can see the benefits to the overall decibel level of a packed lunchroom as well as the mindful eating habits that kids develop through quiet eating, it just seems out of place to me. Children make noise. They talk to each other, they sometimes need to be reminded HOW to do so. Eliminating the choice to talk mildly doesn’t allow them to learn how to make choices. Is the expectation in these school that kids will grow up and eat in silence whenever they are eating in a group setting as adults? Of course not. So I have a difficult time understanding the benefits of doing so in schools. Schools should be places where we prepare students to thrive as adults. I think sometimes schools miss the mark and instead create lessons and processes that are short sighted and only serve to teach children to be “good” students in school. So, armed with these experiences and faced with our own school lunch issues, I am beginning to create some groundwork for students themselves to investigate how playing certain types of music at lunch might alter the decibel level, student engagement level, and the instances of behavioral issues. I’ll be sure to share my results, but I am more interested in hearing from you in the Blogosphere! What was your own experience like at lunch time in school? If you are a teacher, what is the practice for your students and staff? I’d love to hear from you!! !